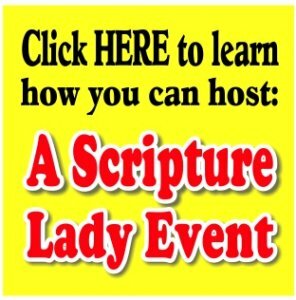 The Scripture Lady loves creating Bible review games! 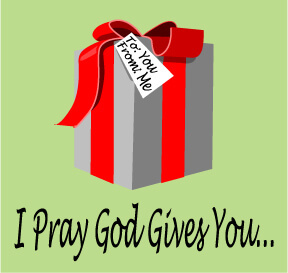 Here is one called “I Pray God Gives You” to teach about the gifts of God. Gift giving is such a big part of every Christmas celebration. God gave us His most precious gift, His Son, so we are encouraged to give gifts to our loved ones in honor of our Lord’s birth. But what kinds of gifts can our children give? Most of them don’t have any money to buy gifts, so what can they give that is valuable and meaningful? Our children may not have any money, but they can pray. Let this fun Bible activity for kids be a lesson in the kinds of gifts that are available for them to give through prayer to their loving Father. For this game you will need to prepare 10 cards that show a nice looking picture of a Christmas present. Each card will display one of the following words: peace, love, joy, strength, healing, wisdom, goodness, patience, confidence, grace. You will also need to prepare the following point cards 2 – 10 point cards, 2 – 20 point cards, 2 – 30 point cards, 2 – 40 point cards, 2 – 50 point cards. Back the gift cards with the point cards. Make sure the point values cannot be seen through the paper. Laminate all of these for long-term use. Lay all the cards down on the floor or on a large table, “gift” side up. Lastly, you will need a copy of the quiz questions called “Which Verse Best Describes…?” found below. Divide the class into 2 teams. Tell the children that they are going to have the chance to pick out “gifts” that they would like to give to a friend or family member. Point out the cards on the floor and mention each “gift” and give an example of how the children can pray and ask God to give each gift to someone they love and care about. For example, when you mention the gift of healing, you might say, “Some of you might know someone right now who is sick and not feeling well. One of the best Christmas presents they could receive is to be healed. You can pray that God would heal them and make them feel better.” Or for the gift of confidence, you might say, “Perhaps you know of someone who needs a job right now and they are feeling nervous about going out on an interview. You can pray that God would give them the confidence to do and be their best.” Continue this line of communication with each gift. Next, pick a scorekeeper and one child from each team. Decide who will go first. Explain that when it is someone’s turn, they will come up and pick one of the gifts up off the floor. Under each gift, is a point value from 10 to 50. They can earn this amount of points for their team if they are able to choose which Bible verse best fits the description of the gift they have chosen. Tell them that you will read 2 Bible verses and they must choose the best description. The team with the most points at the end of the game wins. Tip for playing: Before the child picks up the gift card, have him say the gift he wants and then ask if he knows someone in his life who needs the gift he has chosen. Ask if he could share a little about the person’s situation. After the game is over, you can end the time with a word of prayer lifting up the different people the children mentioned. B: For the Lord God is a sun and shield: the Lord will give grace and glory: no good thing will he withhold from them that walk uprightly.